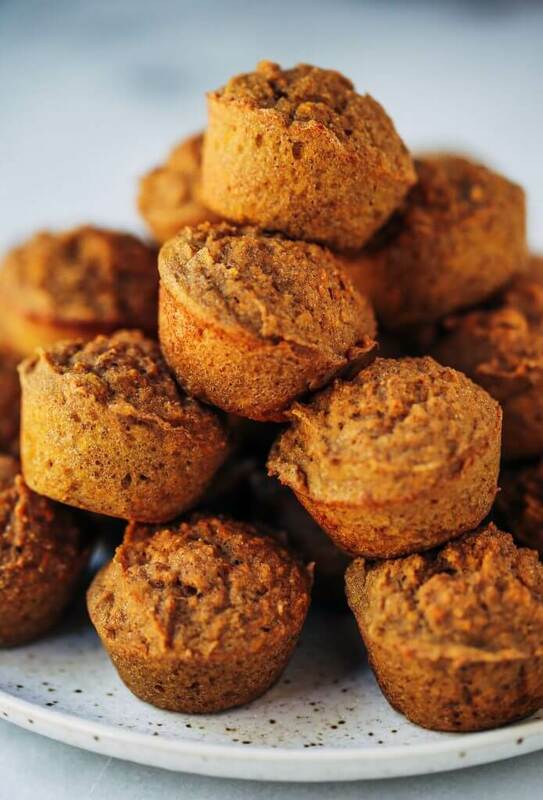 51 calorie banana muffins made with sweet potatoes instead of flour! 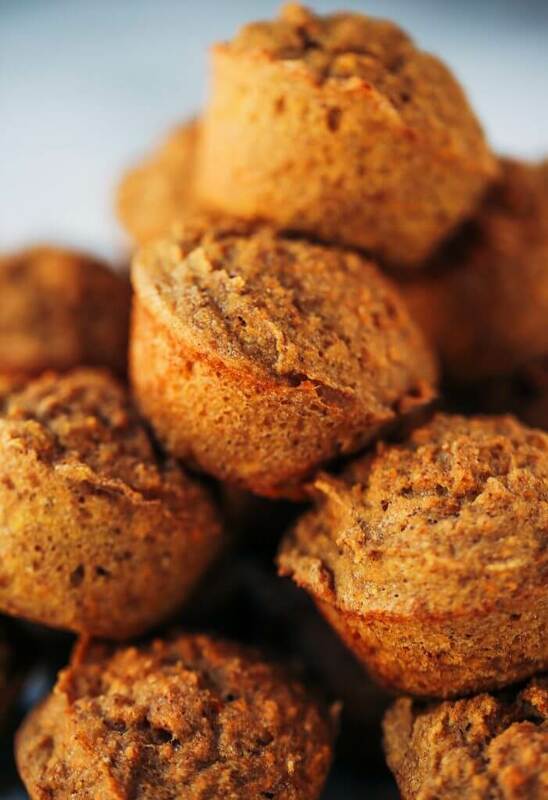 Healthy paleo banana bread muffins make easy paleo breakfasts for on the go. Kid friendly paleo snack idea. I just can’t get enough of baking with sweet potato. It’s like a whole new world opened up and it tastes so good! Such a fan of veggin’ up my recipes lately. Sweet potatoes are a great sub for flour in recipes, because they still have a higher starch content, but still contribute liquid, fiber, and flavor! This recipe is made so easy! 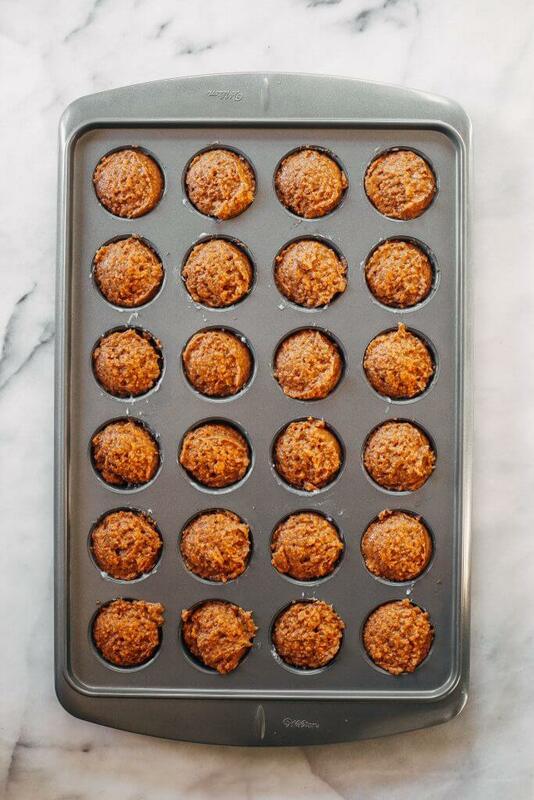 Everything goes into the food processor, then gets blended up, pour into your muffin pan, and bake away! 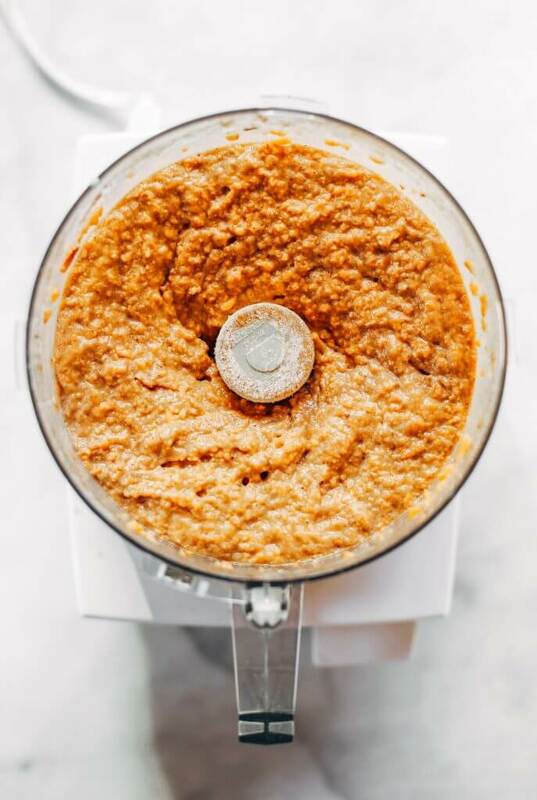 This is the food processor I use- it’s a life-saver in the kitchen and I use it daily! Trust me, it’s worth it. Not sponsored, just love it! 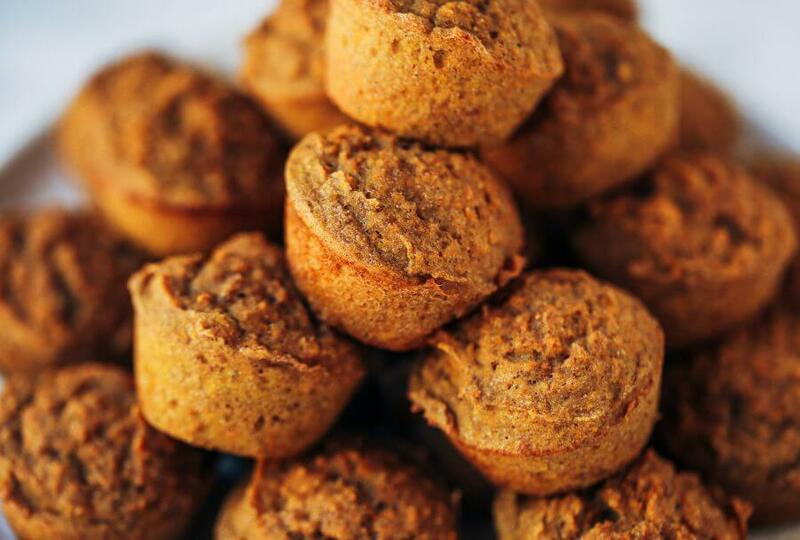 These little muffins make such a great snack for kids or on the go! They can be stored in the fridge for 2-3 days, then I like to keep them in the freezer for freshness (for a couple months). 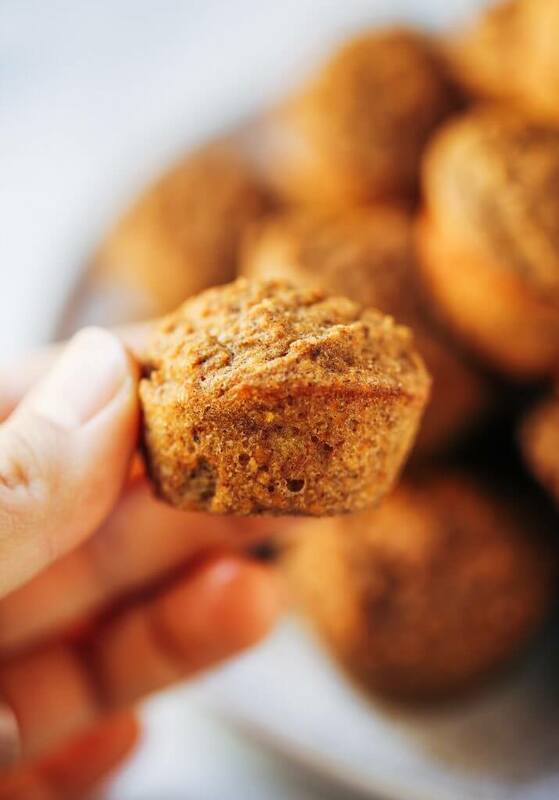 I love to pair these muffins with coconut yogurt or almond butter… let’s be honest: or frosting if I’m feelin’ extra! 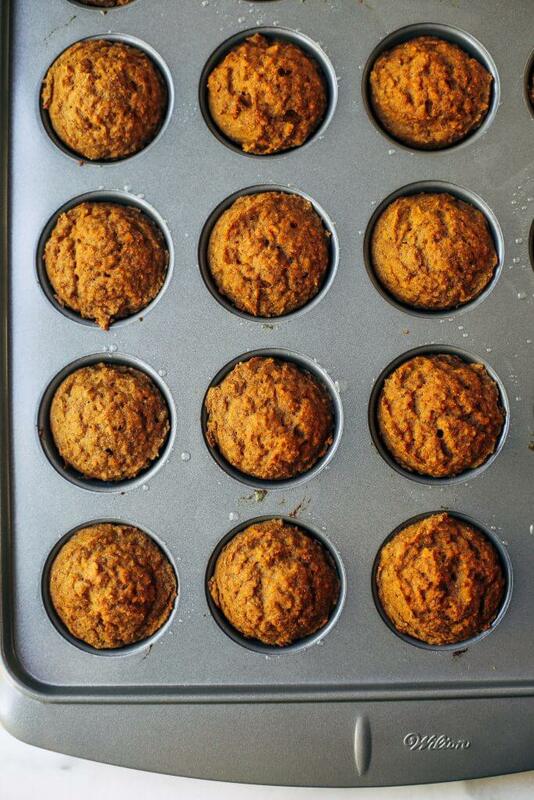 These muffins aren’t super sweet, because I like to keep things natural and not over the top with the sweeteners. You can choose to add more coconut sugar if you feel like they need it. In a food processor blend all ingredients until completely smooth. Use a small ice-cream scoop to fill the muffin tin. Bake on 350F for 20 minutes. Store in fridge for 2-3 days then in the freezer. Don’t you cook the seeet potato before putting it in the food processor? Looking forward to trying this! Any helpful tips on making this egg free? Hi Lacey, I think if you used flax eggs it would turn out gummy, so I don’t know that I would suggest it. I am not very well versed in egg free baking subs, sorry! Would maple syrup or honey substitute for coconut sugar or would that be too liquid? Hi Katie, I think that would be too much liquid in this recipe. Hi Lisa, the sweet potato is raw before cooking in the oven. Can I used regular size muffin tin? Hi Jessie, I think they will be too moist if made in a larger quantity, but you can try! I tried these and the taste is incredible! However… I completely skimmed over the fact that these were mini muffins despite reading the recipe a few times. So, I made them in a regular muffin tin and they were definitely too moist after 20 minutes. I left them in for another 20 but they were still kind of gooey. Maybe change the title to read mini-muffins so that people like me who skim recipes don’t accidentally do this?! Hi! Do you feel the sweet potato first?